The basis of the Quran is the revelation to Muhammad. According to Islam, the revelation was given by the angel Jibreel. Did Muhammad do any miracles to prove what he said happened? No. This is how it all unfolded…. Muhammad had an encounter with an angel. He did not know who or what this spiritual being was. The angel that appeared to him began to strangle and press him violently and tried to force him to recite/read. Even though Muhammad pleaded that he was illiterate but the angel kept insisting and kept up the torture. This happened repeatedly for a total of three times. First of all, an angel is a servant of God and will only do what they are commanded by God. No angel of God has ever acted in a such a violent and abusive manner against a single human being in this way. Secondly, shouldn’t the angel have known that Muhammad was illiterate, yet he cruelly forced Muhammad to do what poor Muhammad just could not do. Thirdly, this incident caused Muhammad such great fear and he was so terrified that he ran back home to his wife Khadija to find comfort. In the Bible, any time that an angel appears to a human being, his first words are almost always, “DO NOT FEAR.” Because such fear is not from God! We see this repeated over and over again the Bible. No prophet was ever abused in such a manner! Muhammad was so overcome with FEAR that he is described in Islamic sources as: trembling, heart beating fast, snorting like a horse, and neck muscles twitching. In fact, Muhammad is convinced that it is a demon! At home Khatija comforts and assures her husband that Allah would not shame him. (even though she did not even witness what actually happened, she was trying her best to make Muhammad feel better; she was just being a good wife!). How did Khadija come to her conclusion that the “angel” was not from satan? By unveling her private parts with the prophet seated on her lap. Her reasoning was that an angel of God would not be hanging around to while she exposes her private parts. Later she and Muhammad went to visit her cousin, Waraqa, whom they hoped could make sense of had happened and advise Muhammad. Waraqa was literate and he was supposedly a Christian. I say “supposedly” because there was a heretic cult in that place at the time. They were the Nestorians, whose beliefs differed from what the Bible teaches. In all likelihood, Waraqa was a Nestorian and not a true Christian, follower of Jesus Christ. What can we know about Waraqa? It is said that he used to “read the Gospel in Arabic”. This is false because the Gospel had not been translated to Arabic at that time! So what was he reading?! It is also said that Waraqa used to “write/copy the Gospel in Hebrew.” Again this is untrue because the Gospel was only translated to Hebrew a few centuries later. So what was Waraqa copying?! When Muhammad relates his encounter with the angel to Waraqa, this man, who was old and almost blind by this time, tells Muhammad that the angel is Jibreel (Gabriel). How and why did Waraqa come to such a conclusion when he himself was not there to witness what happened? Waraqa claims the angel is the SAME Jibreel (Gabriel) that appeared to Moses. But wait a minute! This is a very crucial point. Gabriel did not appear to Moses! There is no evidence anywhere in the Bible or in history where Gabriel had appeared to Moses! Where did Waraqa get his information? In truth, the angel Gabriel is recorded as having appeared to three people in the records of the Bible – Daniel, Zechariah & Mary but NOT to Moses. So what Waraqa said was innaccurate! Muhammad believes what Waraqa tells him. But he is worried that the Arabs might oppose him because of the revelations. Waraqa assures him that he will support Muhammad as long as he is alive. Unfortunately Waraqa dies a few days later having fed misinformation to his nephew, the would-be prophet! 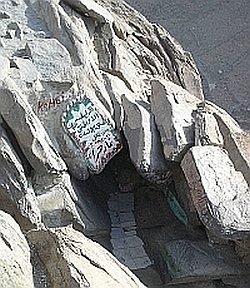 Muhammad is sad and becomes suicidal and tries to kill himself on several occasions. I will give you 3 examples from the Bible of people who were suicidal. 1. King Saul – an evil spirit tortured him. He was often depressed and needed David to soothe him with music. In the end how did Saul die? By killing himself with his own sword. 2. Judas Isacriot – satan entered him. He betrayed Jesus. Regretted it, and he hanged himself. 3. In Mark 9:21 is the story of a young boy who was demon possessed and the evil spirit would always attempt to “kill him by causing him to fall into water (to drown) or fire (to be burnt).” Read the story, Jesus heals the boy. And “the spirit shrieked, convulsed him violently and came out.” And the boy was restored and healed completely. Did you notice that, “convulsed him violently”. That’s what an evil spirit does to a body it can inhabit. Similiar to what Muhammad experienced then? After a period of silence, Muhammad again encounters the same angel. And from then on, the revelations became more regular. 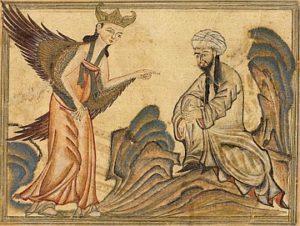 According to Muhammad, the angel that appeared to him had 600 wings. Isn’t this a contradiction? The Quran says the maximum number is 4 wings (sura 35:1), which in turn contradicts what the Bible says about angels (seraphims) that have 6 wings. No record anywhere of any angel with 600 wings! Who is this angel that came to Muhammad? This must be some “special” angel who wanted to terrify and impress Muhammad! Also Muhammad saw the angel filling the sky and horizon and sitting on a throne. A THRONE? An angel that has a throne? This is very very strange! There is no record anywhere that angels have thrones. The throne is only for God. It becomes clear that this being is a usurper. He is not acting on God’s instructions. This being has his own throne and authority and seems to change/disguise himself to have more wings than even God’s angels! Therefore, I am convinved that the angel that showed up to Muhammad was not Jibreel (Gabriel) as Waraqa had mistakenly led Muhammad to believe. Some Hadith sources give the name of the angel as NAMUS. It is worrisome that there are no such names for any angels anywhere else in the Bible or the Quran. “Namus” is an Arabic word that means “law” or “custom”. Whereas “Gabriel” means ‘God is my Strength’. So we have Gabriel whose name shows that he is a servant of God and depends on God as his strength, and Namus, who has his own throne and by the definition of his name, would imply that he depends on the law or customs (rituals). Two very different beings. So who was it who gave those revelations to Muhammad that became the basis for the Quran? What Muhammad experienced during the first encounter shows signs of being an encounter by an evil spirit in the manner in which it attacked Muhammad. Hadiths show that Muhammad experienced the influence of magic, witchcraft, had delusions, became suicidal, became stark raving mad for 1 year before he recovered. Fear is not from God, but from satan. Confusion is not from God. Muhammad was fearful. Muhammad was confused. He was possessed by an evil spirit who abused, tortured and treated him violently so that Muhammad would fall under his authority. It was not the REAL Gabriel. He would never have done that. Waraqa was grossly mistaken. Read the accounts of Gabriel’s visits to humans and notice that his first words are always “Do not fear!” Satan is able to disguise himself as an angel of light. (2 Cor 11:14). In my opinion, Muhammad is not to be blamed. The finger needs to be pointed at NAMUS. Sahih Bukhari Vol 1, Bk 1, No. 3; Vol 6, Bk 60, No. 478; Vol 9, Bk 87, No. 111; Sahih Muslim Bk 001, No. 0301, all by Aisha. Sahih Muslim Bk 001, No. 0304, 0307, 0330, 0331, 0332, 0333, 0337, 0340.